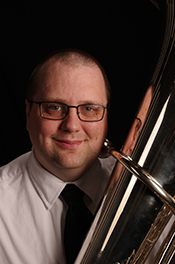 Mr. Black received a Bachelor's degree in Music Education with a performance certificate from the University of South Carolina in Columbia, South Carolina and a Master of Music degree in Tuba Performance from Illinois State University in Normal, Illinois. Douglas was a public school band teacher in Nottoway County Virginia Public schools and a music instructor at Halifax Community College in North Carolina. As a performer, in Peoria, Illinois Douglas performed and soloed with the Peoria Municipal Band. Douglas has played in North Carolina with the Durham Symphony Orchestra and the Triangle Brass Band. Douglas is an active freelance musician in Virginia, North Carolina, and South Carolina. Currently, he is working toward a Doctorate of Musical Arts in Tuba Performance from the University of North Carolina at Greensboro and is the tubist with Tim Zimmerman and the King's Brass.